From "Ask the Captain," a monthly column by Tay Vaughan. Q. A friend warns me that using Stuffit and other standard document compression programs on audio and video files doesn't work very well and could damage files. What's the scoop? A. At Aladdin Systems (408-761-6200) where they make Stuffit, VP of Engineering, Daryl Lovato, assures us that "...the only way you can actually damage a file by compressing it is if there's a bug in the compression software itself." Stuffit, he asserts, is stable and free of any file-damaging bugs, and adds that the loss of a single bit of information in a compressed file can make it impossible to reconstruct the original. Use good media and keep your disks away from magnets and stray fields! On the issue of compression programs not working well for you, here's a brief explanation of the most common cause, over compression: if a data file has been compressed once, it doesn't help to compress it again. In fact, if you compress that file again, it might even grow larger than the original! This can happen because common compression algorithms remove redundancies -- for example, a compression algorithm might replace an oft-repeated "the" in a text file with a simple and shorter pointer back to original word. After finding redundancies and creating many hundreds of pointers, the resulting compressed file ends up containing very random pointer data that are not at all decipherable as a text file. This file can only be decompressed by reversing the process. When an algorithm tries to compress an already-compressed file of random data, there will be few, if any, redundancies to replace with pointers, and it may seem that the program is not working well. Commercial compression products such as Stuffit detect if a file is not being compressed or is getting bigger, and the uncompressed version is substituted. So it might seem as if there is no net gain. But at least your file hasn't gotten larger! Maybe the neatest creative spin-off from all the recent serious research into compression techniques are the many peculiar new words that have entered the arcane lexicon of computer programmers, such as freshen, pack, crunch, squash, shrink, crush, implode, distill, squeeze, stuff, and garble. When you throw a few atoms and bestGuesses into this potpourri of words, the language of data compression joins that of modern physics, with its own quarks, gluons, and happy and sad particles. Q. I am a professional writer of corporate video scripts. I am very interested in learning to write for Multimedia/Interactive Video. After much research, I still haven't a clue where to find the knowledge I need. Any thoughts? A. You will be pleased to hear that most of the creative skills you currently use when writing a video script are applicable to working with interactive multimedia. In script writing, you design a flow of events that contains detailed descriptions of scenery, actions, people, and dialog. The video then produced from your script is the vehicle that delivers your messages, your meanings, and vicarious experiences to the viewer. Designing an interactive multimedia work is analogous to writing a video script. The task requires you to spend similar effort organizing your messages and content, with the major difference being the nature of the medium. For video, you organize your material into a linear sequence of images and sounds unalterable by the viewer but effective in getting your message across. For the multimedia medium, you organize your material into a choice-navigable structure (designed by you) that brings those messages to the end-user through interaction. You will need to learn some new tools and their capabilities and constraints just as you did in video. Reading magazines such as NewMedia is a good place to start, short of purchasing a lot of hardware and software and jumping onto some very steep learning curves. The really unique new element offered by interactive multimedia, however, is this choice-navigable structure, the branching tree upon which you hang the many text, graphics, audio, and video elements that carry your message. There is no developed body of knowledge or time-tested set of rules about how you should build this tree. With interactive multimedia still in its infancy, designers are trying many different and often very creative methods for parsing their elements and organizing their messages with user choice and navigation in mind. The proof will be in which of these models end up actually working well, their success likely measured by profit in the consumer marketplace. Information about basic structures ("this is a tree, here are the branches") is available in many of the multimedia texts on bookstore shelves (try my own Multimedia: Making It Work from Osborne/McGraw-Hill). Look for local college and continuing education programs about multimedia to help you become familiar with terms and tools. Run some existing multimedia titles and see how they are put together -- many electronics stores like The Good Guys or Circuit City have kiosks where you can play with CD-I and PhotoCD titles. In the end, do what you do now, and grow your own multimedia tree from your creative visual and audio ideas. Q. Captain....HELP!! I work with a company that does closed circuit television surveillance, recording images on SVHS time lapse recorders. Sometimes during review/playback an image will be shadowed or blurry, and I am looking for a hardware and/or software solution that will allow me to enhance the image. A. Try digitizing your video surveillance tapes into QuickTime movies, then use a video-editing program such as Cosa's (401-831-2672) AfterEffects or VideoFusion's (419-891-1090) VideoFusion to enhance each frame using any of a number of plug-in filters for brightness/contrast and sharpening. Adjust your compression settings to yield the highest resolution and best final image. If you just want to grab the low-contrast, fuzzy image of a mugger looming over the shoulder of the unfortunate midnight user of a bank's ATM, you might just take the best frame from your time-lapse reel, and enhance only the mugger with an image-editing program like Photoshop, where de-interlacing, sharpening, and other filters may yield a 1200 dpi image suitable for police investigation posters and composite drawings. We have heard that recent testimony about the beating of Reginald Denny during the L.A. riots of 1991 included enhanced video tape footage originally shot from a helicopter. The defense attempted to invalidate this condemning evidence on grounds that the images had been "retouched" and no longer represented the truth. The prosecution prevailed, however, when the expert who enhanced them explained that all the images in the video frames were uniformly and consistently sharpened using a mathematical algorithm, and were therefore only a sharper representation of the truth, not its substitution. 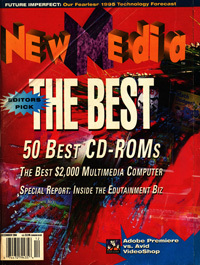 For five lucky NewMedia readers who send in questions for the Captain during the months of November and December, the Captain has arranged a special bridge-to-bilge tour of a working container ship while it is loading at berth in San Francisco Bay, January 5, 1994 (during MacWorld Expo). Send your questions to TAY c/o NewMedia, 901 Mariner's Island Blvd., Suite 365, San Mateo, Calif. From "Ask the Captain," a monthly column by Tay Vaughan. Q. Is there any special hardware or software that I need to have to take advantage of the new triple- and quadruple-speed CD-ROM drives (such as the NEC 3X series) that are becoming available? A. In a normal single-speed CD-ROM drive, the compact disc spins at a constant linear velocity (CLV) so that data can be read at a constant density and spacing. This means the rotational speed of the disc may vary from about 200 rpm when the read head is at the outer edge, to 530 rpm when it is reading near the hub. This translates to about 1.3 meters (51 inches) of travel along the data track each second. CD players use very sensitive motors so that no matter where the read head is on the disc, approximately the same amount of data is read each second. The CD's rotational speed and the density of the pits and lands on the CD allow data to be transferred from the CD at a sustained rate of 150K per second, the CD-Audio "Red Book" standard. This is sufficient for reading and playing high-quality digital music and sound, but it is very slow for reading large multimedia files containing images, video, and animations, especially when compared to the many-times-faster data-transfer rates of hard disk drives. 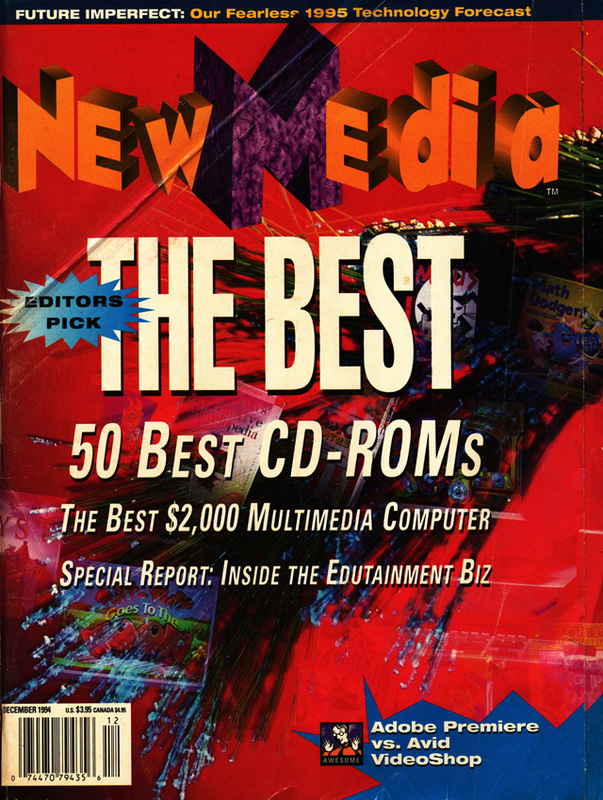 The new generation of CD-ROM drives designed specifically for computers can spin twice, three, or four times as fast as vanilla 1X CD-Audio players. When they read a computer data track they crank up; when they read "Red Book" audio, they automatically switch back to the default 1X transfer rate of 150KPS. On a mixed mode disc you can access both audio and data tracks, but you cannot access both at the same time. Be sure the driver software for your higher-speed CD-ROM drive is current -- it should recognize the "signature" of the attached drive so that the drive will switch speed upwards at the right times. In most cases, if the driver is not correct, the worst you will suffer is slow performance at a default 1X speed. Jeff Veis, product manager for NEC's new 3X series of CD-ROM drives, suggests that developers should consider designing "scalable software" that takes advantage of the higher transfer rates when available on the end user's platform, but that also provides adequate alternatives for default performance at 1X. This might mean designing two separate animations, one for slow, one for fast transfer rates. It also means that multimedia tool developers must provide a method for sensing the speed capabilities of the attached drive, and at least one well-known tool provider is doing just that! "As intermedia applications continue to proliferate, producers and designers need to know how to float between print and color pigment, digital color and RGB as viewed on a monitor, and analog color as viewed on a television screen. Color formulas for multimedia, especially when it is interactive, depend heavily on human factors. Contrast, the degree of tonal difference between one color and another, is often more important when working with color on a computer screen. A combination of pure yellow with pure violet, or blue and orange, for example, will vibrate when viewed in RGB. On video, disturbing flickers, extraneous colors and other artifacts usually appear on the borders between pure complimentary colors. On top of that, colors that look great on your computer monitor may not even show up when transferred to video. Important elements can be emphasized by using fully-saturated colors against a neutral background, whose color may complement as a grayed-down tint of the color. When readability is important, contrast in color saturation and value between the type and its background really works, using almost any color combination. Red or green may need to be avoided as cue colors because 8% of the population is color blind to some extent, and cannot see reds or greens in their true color value." I have searched every resource I have, and have been unable to find a method for sharing audio files between Mac and Windows users on a LAN or as voice-mail attachments. What I need is a Mac application that can translate .WAV files and play them (on the fly), and/or a Windows application that can play .AIF files. Any leads? A. Every time I have a conversation with a sound or music software company, I ask whether they have a simple translator routine between .WAV and .AIF; so far, I haven't found one. But I have had some experience with Macromedia's Director 3.1 and the 3.1 Player for Windows. Using the sound playFile Lingo command, the Windows Player will play EITHER a .WAV or an .AIF format sound file after "gaffing" the Macintosh version to the PC. If you drop your voice-mail .WAV or .AIF files into a directory with a known path name on your LAN, you could program Director to select and play these files. Send your questions to TAY c/o NewMedia, 901 Mariner's Island Blvd., Suite 365, San Mateo, Calif. 94404 or send a fax to (415) 573-5131. 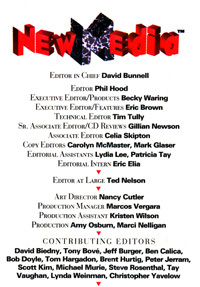 Writers of published questions will receive a NewMedia T-shirt and prompt answers to their questions. Tay is president of Timestream, Inc,. a CD-ROM and multimedia title production and publishing company, and is author of Multimedia: Making It Work, (Osborne/McGraw-Hill). or send a fax to (415) 573-5131. Writers of published questions will receive a NewMedia T-shirt and prompt answers to their questions. Tay is president of Timestream, Inc,. a CD-ROM and multimedia title production and publishing company, and is author of Multimedia: Making It Work, (Osborne/McGraw-Hill).